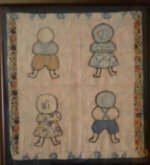 Popular through the early 1800s, Medallion quilts were made in a style that had actually been brought to America from Europe by the colonists. In simplest terms, a medallion quilt is made of a central motif surrounded by multiple borders. 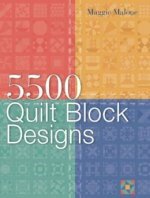 The center and borders could be pieced, appliqued, or embroidered, in any number of combinations. The center of the quilt is the focal point framed by the borders. Some popular centers included pieced blocks, appliqued or embroidered designs, and picture fabrics. 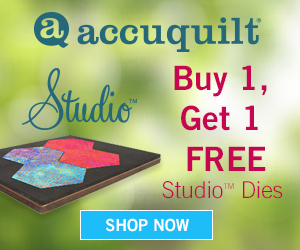 Until the late 1700s, applique was the dominant method of creating the center of the quilt. As quilters developed innovative ways of making quilts with limited resources, pieced centers became popular. Some of the earliest pieced centers were star patterns, but many other block designs are appropriate. 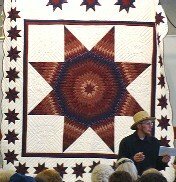 Special commemorative fabric panels were printed commercially for use as center medallions in these quilts. These panels celebrated events such as famous battles, coronation of Kings and Queens, and the inauguration of Presidents. There are many different ways of setting and framing the central medallion. 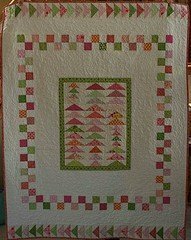 Multiple borders made up of plain strips of fabric, pieced strips, such as the stars and flying geese in the Star of Bethlehem and Geese in the Forest quilts shown below, and embroidered or applique pieces, provided infinite possibilities. Popular since the early 1800s, the magnificent Star of Bethlehem quilt is popular with Amish quilters. With their deep commitment to God and the teachings of scripture, Amish quilters may have been inspired by the biblical connection to this design or simply by the challenge of the intricacies of the pattern. The radiant colors seem to pulse from the center of the star. In addition to the careful piecing of the diamonds, the plain areas are filled with elaborate quilting designs. 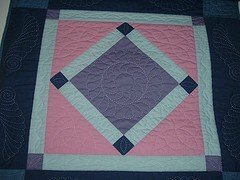 Diamond in the Square, a deceptively simple looking medallion quilt, is another particularly popular Amish design, that consists of plain, solid-color pieces of fabric for the central diamond and borders. Intricate quilted designs are stitched across the entire quilt, creating a stunning full-bed design. Geese in the Forest, a uniquely-pieced center medallion of varying sizes of Flying Geese blocks, is framed by intricately quilted plain borders alternating with pieced borders.